Join us as we laugh for a cure at DDF’s 10th Annual Night of Laughter. The night will feature hilarious comedy, delicious food, drinks, raffles and more. 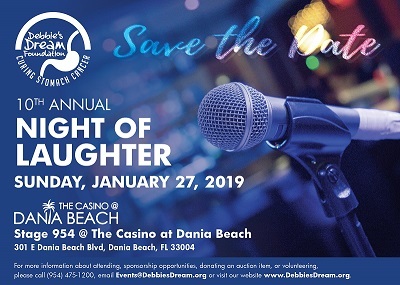 Contact us to become a sponsor, join the committee, donate an auction item, place an ad/tribute in the Program Book, and for more information at (954) 475-1200 or Events@DebbiesDream.org.